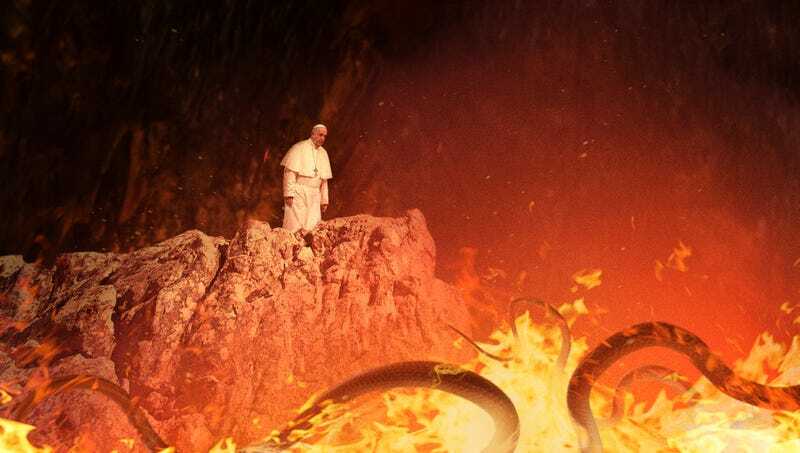 OUTER DARKNESS, HELL—Becoming disoriented by the sight of a shrieking, many-headed snake emerging in agony from a nearby lava pit, Pope Francis reportedly found himself in the depths of Hell Friday after taking a wrong turn in the nigh-endless catacombs beneath the Vatican. “Ah, crap, not again,” said the Pope, cursing his phone’s lack of service and wondering if he should have turned left at the Holy See’s acre-wide pile of Nazi gold. “It always takes me forever to find my way back, even if I can find a demon willing to give me non-allegorical directions. I guess since I’m already down here I’ll check out this Lake of Fire that [former Pope] Benedict says is a must-see, but still, what a way to spend a weekend.” The Pontiff admitted, however, that his infernal excursion was better than the time he got lost in the Vatican’s parking garage, wound up in purgatory, and spent all day listening to the crying of unbaptized babies.